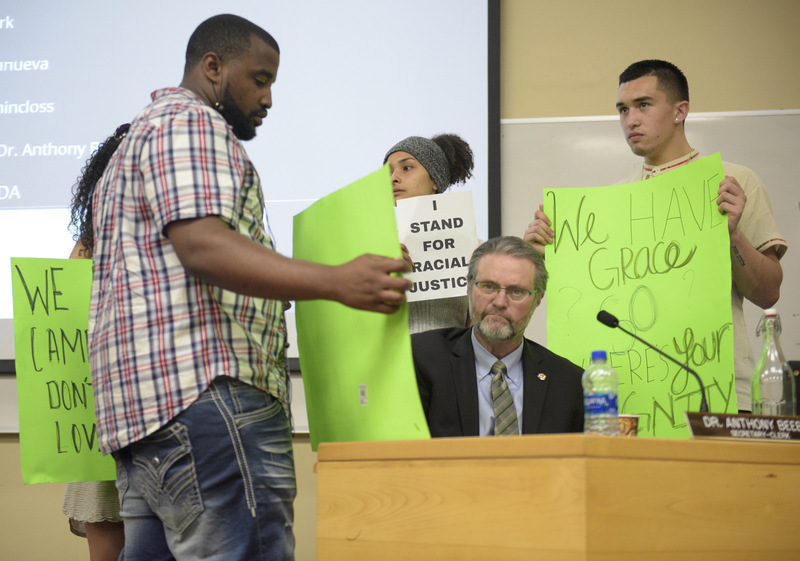 Photo: Paul Wellman Students protested racial tensions on campus for over two hours in January during public comment period of a SBCC Board of Trustees meeting and continued demands that Vice President of Business Services Lyndsay Maas be fired for using the n-word at a November 2018 equity meeting. After months of back and forth between board members, the Santa Barbara City College Board of Trustees finally acted on an inclusion and campus-climate resolution at its April 11 meeting. What originally began as an anti-racism resolution was watered-down to a campus-climate resolution with one mention of racism and no mention of bias. The resolution passed 5-2, with the two opposing votes made by trustees Veronica Gallardo and Craig Nielsen. “I’m not willing to give an inch on anything that someones going to run with and try and make our college something that it’s not,” said Gallardo. Trustee Kate Parker had called for an anti-racism resolution at the trustees’ February 14 meeting, when a resolution to include the Pledge of Allegiance at board meetings was taken up. The February 14 meeting, not unlike others before or after it, included racially charged public comment. Black students and faculty shared their experiences of what they perceived to be discrimination on campus, and a white man used the unabbreviated n-word. The anti-racism resolution was first placed on the agenda for discussion and edits for the February 28 meeting. It sparked heated public comment from both supporters and opposers. The resolution passed only after almost two hours of discussion and compromise between board members. Trustee Peter Haslund led discussion and worked primarily with Trustee Marsha Croninger to reach a consensus on a resolution that could be supported by the majority. Student Trustee Kenny Igbechi commented, “You say there’s no need to pass a resolution for this … but just some months back we passed a resolution [to add] the Pledge of Allegiance,” said Igbechi. “If the climate of this college isn’t good for [students] to have a very good education, I think it’s important for this board to take a stance. The resolution reaffirms the college’s mission of serving all students and of cultivating an inclusive educational environment. It can be read in its entirety here.